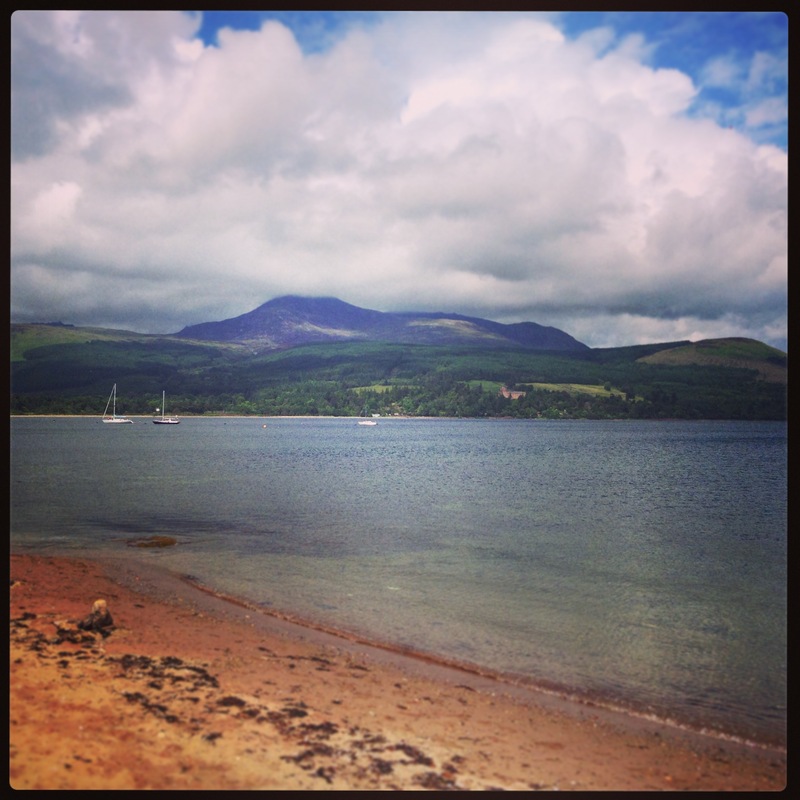 I’ve been lucky enough to visit some of the most incredible places the world has to offer, but, no matter how I look at it, the Great Barrier Reef, New York City and Maya Bay just don’t quite compare to the humble Isle of Arran. Situated off the west coast of Scotland, this island was the destination of almost every holiday I enjoyed during my childhood. Come rain or shine, I spent my days in and around ‘The Bungalow’ – my gran’s unique island abode – in Whiting Bay. Proudly elevated above Shore Road, the sandstone-fronted bungalow overlooking the beach had been extended several times over the years and became a residence of many elements: the front house (the luxury quarter where my gran lived); the back house (the self-contained, no-frills accommodation for family units on a fortnightly stay); the annexe (a small cupboard off the back house kitchen with a bed wedged in and no door – exclusively for the use of my unfortunate male cousins when beds were in short supply); and the penthouse (an unrenovated loft space with mattress for my even more unfortunate male cousins when the comparably opulent annexe was occupied). The bed policy was unashamedly sexist, but I wasn’t going to complain about it and risk spending a night in the penthouse with spiders the size of salad plates. Unfortunately when my gran passed away some years ago, the house had to be sold and my heart was shattered into quite a few pieces. But thankfully I still get to spend a bit of time on Arran now that my family members have bought their own island boltholes. Last December, however, I spent a couple of nights in a hotel on the island for the first time ever. I was enticed into this unprecedented move as a result of the no expense spared renovation of the iconic Douglas Hotel. Situated directly across from the pier in Brodick, this once-grand red sandstone pile had degenerated into an eyesore over the years but has been completely transformed into a luxury boutique hotel. Craig and I had a fantastic winter break and knew it wouldn’t be long until we returned. A couple of weeks ago, thanks to a generous gift from Craig’s mum and dad, we spent another weekend at the wonderful Douglas and – once again – it did not disappoint. The decor, the atmosphere, the staff and the food make it the perfect balance of contemporary and traditional, of stylish yet relaxed. After a wander during the day and a couple of G&Ts before dinner, we settled into the bistro for a delicious meal. 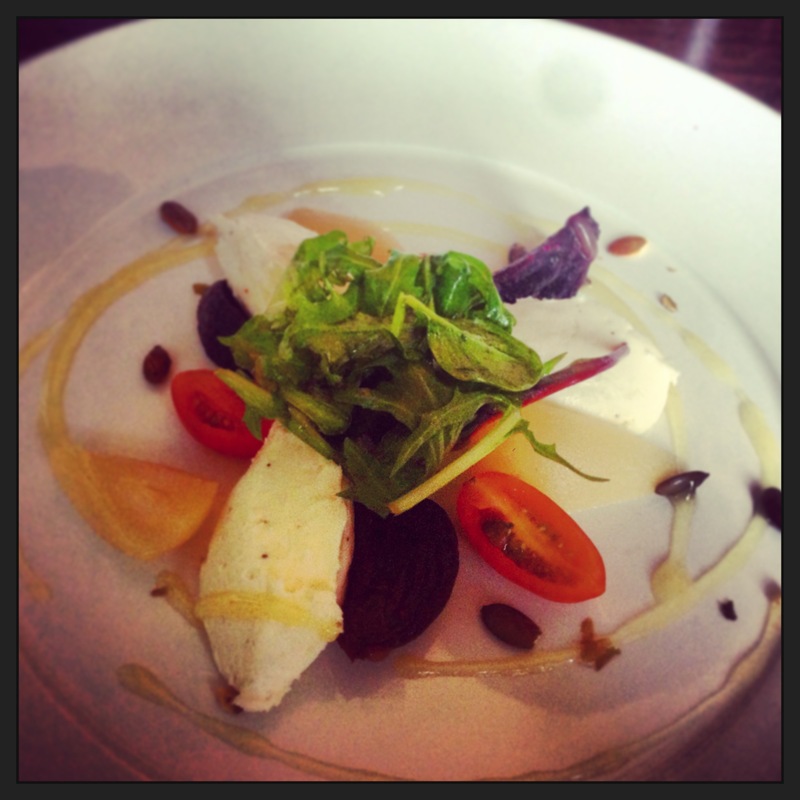 To start, I opted for the beetroot, peppered goats cheese, cider poached pear and pumpkin seeds. I’m seldom able to pass over a goats cheese starter and this was one of the best I’ve had. Not only did it look stunning on the plate, but the goats cheese had the creamiest whipped texture which was cut through beautifully by the sweetness of the beetroot. 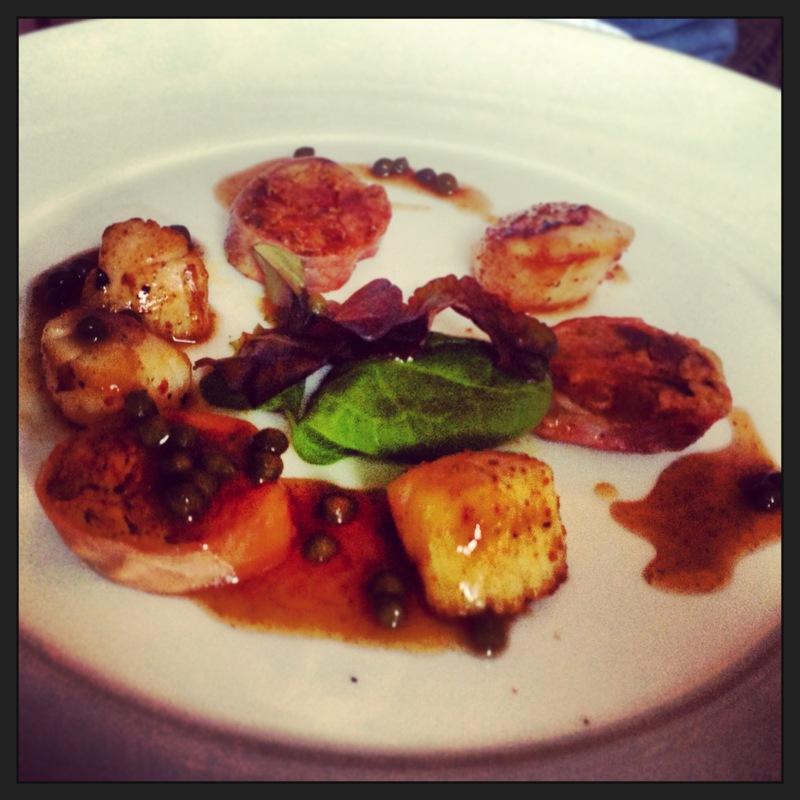 Craig hit the foodie jackpot with his choice of Loch Fyne scallops, parma ham, confit duck and caper and lime sauce. The combination of scallops and duck struck me as a little unusual but it well and truly worked a treat. I only managed to snaffle a mouthful or two for myself but from that I can tell you it was excellently prepared and, should I get the chance to order this in future, I’ll be keeping every last mouthful for myself. Here I have to make a special mention to the hotel owner, Sean, who – by a series of bizarre coincidences – had met Craig in St Petersburg back in 2006 and showed him and a couple of his travelling companions a wild time over the space of a week. Sitting in the hotel bar mid-afternoon, Craig couldn’t quite believe his eyes when he recognised Sean and his wife as they passed our table, and it was even more to our surprise when we realised he also owns the place! After chatting before dinner and enjoying a couple of drinks with his family, Sean very generously sent us over a lovely bottle of champagne between our courses which we gratefully guzzled over the next couple of hours. He was a wonderful host and really has done a marvellous thing in bringing this decrepit hotel back to life with a resounding jolt, miles better than it ever was before. A little too ‘distracted’ by the liquid offerings on the table, I didn’t manage to capture any more photos of our meal but I can tell you that the 28 day dry aged rib eye of beef, roast shitake mushrooms, white anchovy butter and chunky fries was a most satisfying feed. The beef was full of richness and the chips – served in kitsch mini frying basket – were top class and of the delicious crispy-on-the-outside, perfectly-fluffy-on-the-inside variety. Craig, meanwhile, had a hearty venison chasseur which I know he gobbled down gleefully. We couldn’t even manage a dessert to share, so full of delicious goats cheese, scallops, duck, steak, venison, chips and champagne we were. It was a veritable feast and one I wish I could relive right now. I cannot recommend this place enough. Our room was beautifully decorated, very comfortable and not the slightest bit pretentious. The bar is relaxed, interesting and radiates a great, convivial atmosphere. The bistro, more formal as it should be, is stylish, spacious and bright. And finally, the entire staff is fantastic. Friendly, very happy to help and full of enthusiasm for the place, they make the Douglas Hotel what it is and ensure that we’ll be back time and time again. Check it out on Tripadvisor where you’ll read all you need to know. Categories: Eating out, Reviews, Travel | Tags: beef, beetroot, Brodick, champagne, duck confit, food, goats cheese, hotel, Isle of Arran, Loch Fyne, pear, pumpkin seeds, review, scallops, Scotland, The Douglas Hotel, venison, Whiting Bay | Permalink.